My name is Jessica. I live in a small town in the Northwestern US, where I keep busy being a Mom of four, working in higher education, and staying involved in church and neighborhood activities. I have been married nearly 25 years to my best friend, Bryce. Thankfully, we have a lot in common. One of those commonalities is traveling. We have always loved to vacation, but as our kids have gotten older, more extensive travel is easier and actually possible. I created this blog so I could journal on the road using text, pictures, links, and maps. I wish I could say I always remember the details of my adventures, but sadly, my memory gets fuzzy faster than I would like to admit. This way I will have a record so that if (when!) we return we are ready to revisit all our favorite spots without having to start from scratch again. And if, in the meantime, others fondly remember our travels together, or it helps anyone plan a vacation, all the better! I welcome your comments, thoughts, advice, experiences, and links! Please feel free to offer your two bits. I would love to benefit from others’ experiences as well. While on the road, I blog directly from my IPad using my camera connector kit and the WordPress app for IPad. It is nothing fancy, but it gets the job done. Once home, I can add other information easily. 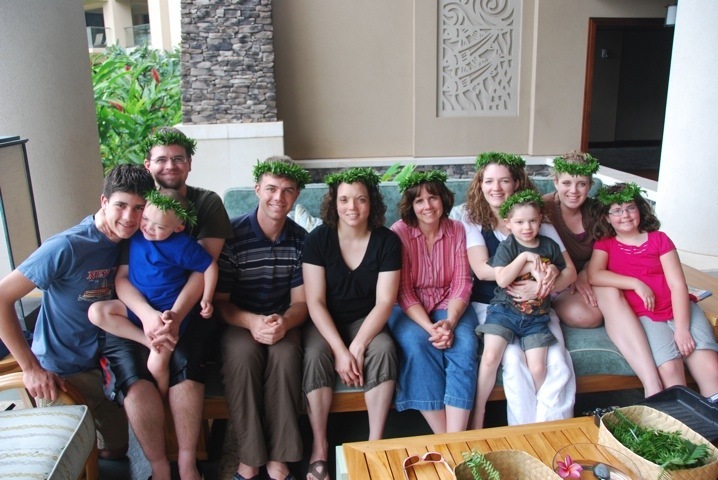 With my extended family in Maui this March. Hie Jessica. I love reading about your experience on all your traveling stories. I have yet to travel very far myself as I have four young children. For now, let me read from the experiences of others and dream one day I will be able to visit some places too. Keep writing! I also have four children and they were small once too! My oldest is almost 20 now and my youngest is 9. It has just been within the last two years that I felt I could leave for longer than a day or two. I never left when any of my kids were two or under. Also, when my youngest was seven family vacations became a breeze. She could keep up with us, and we were no longer having to stop every hour for snacks or bathrooms. The time will come! Travel is a possibility if you make it a priority. Smaller trips with your kids now will make them road warriors in the future. Thanks for stopping by! It’s so nice that you travel so much. A couple months ago you left a comment on my bog about my FP post and I am, just now, getting around to visiting all my nice commenters’ blogs. Thank you. Why thanks for stopping by! And bonus for me–you reminded me that I liked your blog and I want to keep up on it. Isn’t it hard to stay on top of it all? I’m afraid that what I really like to do (like blog lurk) gets shoved aside. Instead, I do laundry. Dear Damommachef: Happy New Year! I wanted you to know that my annual report came out today, and you were one of my top 5 commenters of 2011! Thanks for all your support and thoughtful responses. All the best for 2012 – looking forward to hearing more from you! You are so welcome. I love your blog as I always find is both thought provoking and useful. I fell off the planet a while back….the combination of finals, Christmas, and three trips back to back has made me sadly unable to keep up with my cyber space pursuits. But I am raring to go in January! Keep those posts coming, and I will try to do the same! I am so glad! Thanks for stopping by. I was in my late thirties before I did much traveling; I had to wait a while for my kids to get older, and it took a while to swing it financially. If you make it a goal and priority you can definitely make it happen!